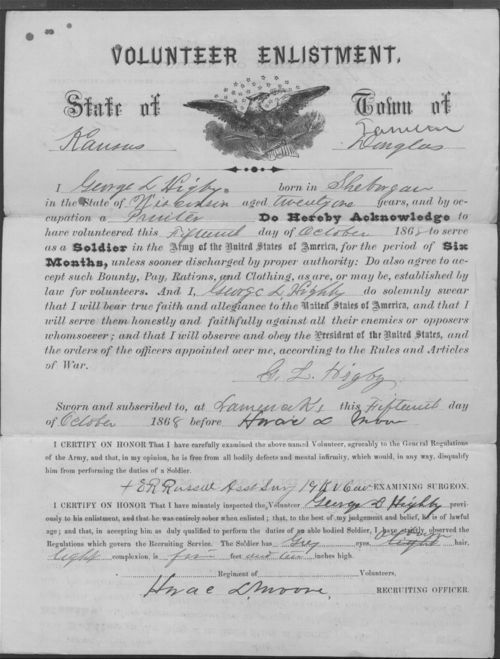 This volunteer enlistment form belonged to George L. Higby, who volunteered to serve in the 19th Kansas Cavalry, Company D, for the period of six months. The 19th Kansas Cavalry was organized in 1868 in order to fight native tribes in western Kansas and Indian Territory (present-day Oklahoma). This source can be grouped with other sources from the 19th Kansas (including equipments lists, rosters, and general military orders) to teach students about the military's presence on the plains.